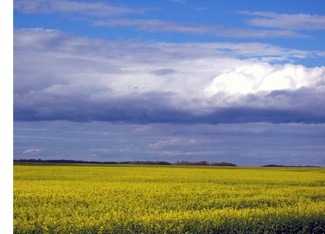 This picture of a Canola crop in bloom was taken late yesterday afternoon near the Harvest Valley Viterra terminal. What this picture does not show is how thin this crop is and how every low spot has no crop whatever. While the amount of seeded fields is in that 50% range those crops need to be protected or treated for the normal problems. Farmers need to spray the fields for weed control and some crops are in great need of spray to inhibit the development of fungus. 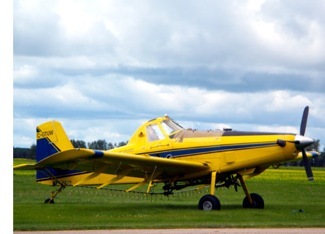 It is likely that this Air Tractor owned by West Wind Airspray Ltd. of Lethbridge which was working today spraying fields near Tisdale was applying a fungicide. Though many farm operations have attempted to apply chemicals with high wheel sprayers the process is futile and leaves even more damage to already thin crops. The fields are just laying in to much mud and water for ground spraying. This week in Saskatoon there are meetings between the federal and provincial ministers of agriculture and the main topic of discussion is what to do about the current agricultural crisis. This year's woes are magnified by the dramatic drop in commodity prices so that even if there was a bumper crop in 2010 farmers would see only 45% of the income they received last year. 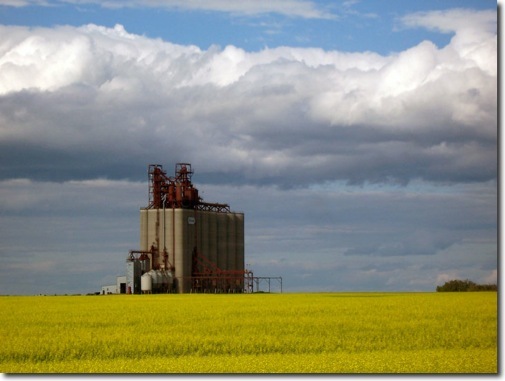 Quite simply agriculture as we know is not a viable economic activity and with larger agricultural operations there is just no profit in the marginal nature of Western Canadian agriculture as it is presently organised. When agriculture in the West was a family farm situation just scraping by, making due was excepted and considered a part of the agricultural industry. Now with large farms being operated as small businesses the bottom line is much higher than it was before and thin margins and bad years spell obliteration simply because to much debt is in need of being serviced. A recent survey of businesses as to their outlook on things showed some shocking results. Farmers have a 51% confidence in things while other business in Canada has an average outlook of 86%. This was reported in a story in the Leader Post and Star Phoenix today and you really should look it over because it points out that the present financial structure for Western Canadian agriculture must be totally re-vamped if it is to be sustainable. 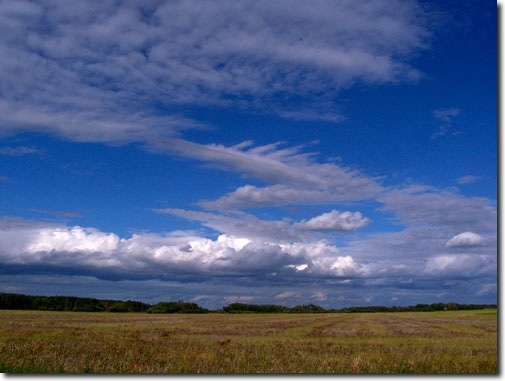 Below is one of the many many fields in Saskatchewan that was not planted this year and over head the continued unsettled sky of a truly unusual wet summer in this usually arid province.